Hiya guys! This is shaping out to be such an exciting weekend of polish releases. Believe me I can barely keep my head on straight to keep track of them all. But, of course, there are ones that you simply cannot forget about. Mainly Polish Pick Up, but also a personal favorite of mine Supernatural Lacquer. There are a couple of a new releases along with some restocks, so I'm breaking up my posts to make it a bit easier. Today I'm sharing swatches for Atropos by Supernatural Lacquer, which is a re-release and revision on the original from a few years ago. Unfortunately I don't have the original to do comparison swatches. I definitely pride myself on my Supernatural Lacquer collection, so I'm so pumped to see this one make a come back! Without further ado, let's get to the swatches. Atropos by Supernatural Lacquer will be available for pre-order tomorrow Friday, September 1st at 9PM EST. The pre-order period will only be open until Sunday, September 3rd at 9PM EST. Each full-size retails for $9.00 and remember to use code MM10 to receive 10% off. 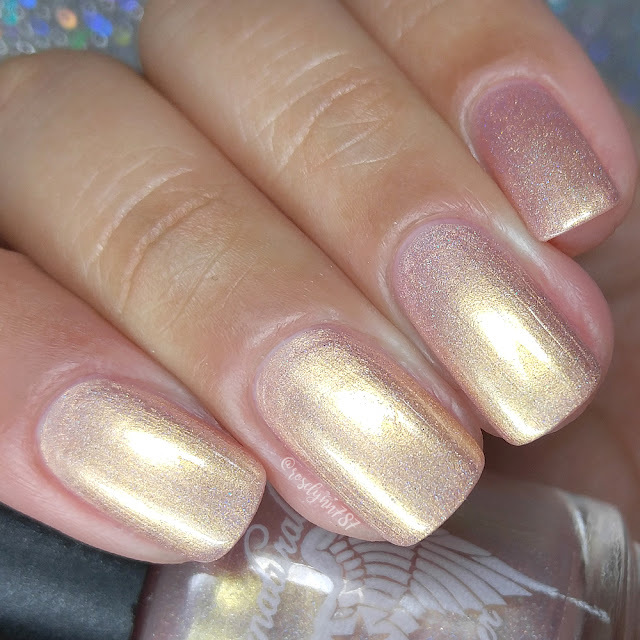 Atropos can be described as a rose gold shimmer with a strong golden glow and hints of scattered holo. Named after Atropos from the TV show Supernatural, she's the goddess of fate and destiny. I'm absolutely swooning even as I write this post. I think I ended up wearing this shade for like an entire week, which is definitely a rarity for me! It was SO freaking awesome to wear this shade and have it not clash with my skin-tone. Major win points. Definitely a must-have, especially if your skin-tone range is similar to mine. The formula has very nice opacity considering how light of a shade it is. Though not opaque enough to be a one coater, it does build up fairly easy for full coverage. It has a nice balanced consistency, not too thick or too thin. There are minimal brush strokes in the finish that mostly blend out after topcoat. Needless to say there is a lot of shimmer in this beauty. On removal the shimmer does tend to stick with you and needs a little extra hand washing/cleaning. Nothing too major or annoying. Shown here in two coats and sealed with a glossy topcoat. 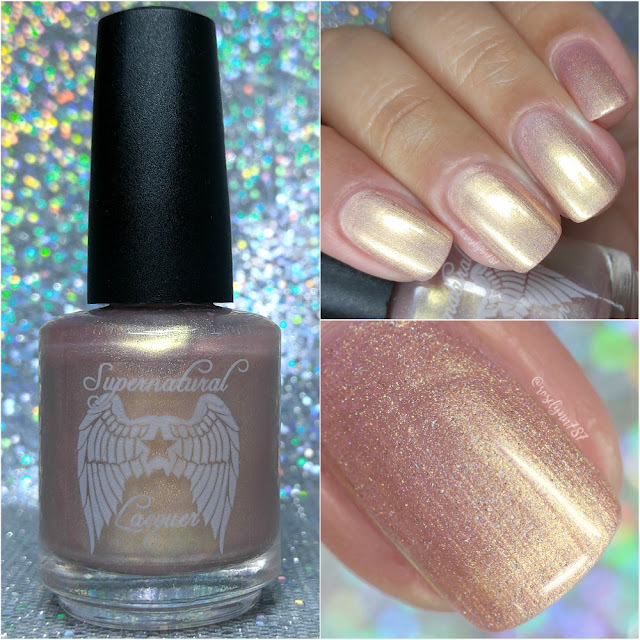 Overall it's no surprise really that this is another stunning and incredible shade from Supernatural Lacquer. As I mentioned before, it's one of those rare times this kind of tone looks against my skin-tone which makes me love it that much more. Plus I'm a huge fan of rose gold... that's actually an understatement... rose gold watch, rings, iPad, headphones, charger cables, pens, the list could on for days really. Haha. So needless to say it definitely won me over in multiple ways and I totally have to give it the must-have stamp of approval. Especially if you don't own a rose gold polish. Like really I'm not trying to judge but uhhh... come on bruh! Come on guys, tell me I'm not the only one in ga-ga mode over this shade! Let me know down in the comments what you think? 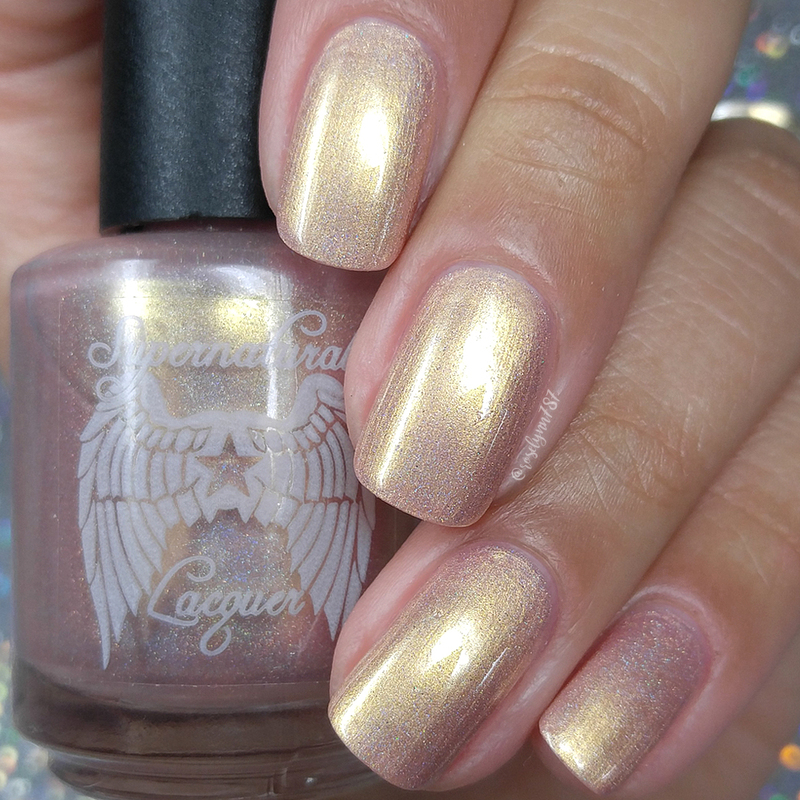 To recap, Atropos by Supernatural Lacquer will be available for pre-order tomorrow Friday, September 1st at 9PM EST. The pre-order period will only be open until Sunday, September 3rd at 9PM EST. Each full-size retails for $9.00 and remember to use code MM10 to receive 10% off. The September Holo Hookup is LIVE! Tonic Polish - Unicorn Pee is coming!